London based Cisco Ferreira, or The Advent, can be described in many ways: a musician, a pioneer, a sound designer, a steady force, one persistent m*therf*cker, a rebel, an icon, an outsider, a great live artist…Mostly though, The Advent is known for his interpretation of what we call Techno. Ever since young Portuguese Cisco discovered Acid House in the London clubs he frequented, his journey has been about making his mark on the electronic music scene. Or, as he recently put it himself: “I’ve been doing this for quite a few years and I’m not going anywhere.” This sums it up pretty well; you won’t see Ferreira naked, shooting promo videos carrying a dog, or hear him publically worrying about the sincerity of the average EDM jockey. He’s everything about techno you’ve learned to love, without the circus you’ve learned to accept.Fresh out of college, Cisco’s hunger for sound landed him a job as assistant sound-engineer in several recording studios. There he learned about the art of translating feelings to frequencies, while at the same time recording various high profile artists from the world of Rock, Pop, Dance, and Reggae. When acid label ‘Jack Trax’ moved in next-door, Cisco started recording for the likes of Adonis, Fingers Inc, Marshall Jefferson, and Derrick May. These rendezvous sparked the inspiration for his first EPs on R&S and Fragile.In 1994 Ferreira signed a record deal for 12 EPs and 3 albums together with Colin McBean. This was the beginning of an era during which the duo set a worldwide standard for high quality underground Electro and Techno. They hit the world with a refreshing sound, both as The Advent, and ‘G Flame (Cisco) and Mr G’, the alias Colin is still using. Nowadays The Advent is a solo project, bombarding crowds around the world with its trademark raw, energetic sound. A sound that grants him yearly slots at festivals as Nature One, Awakenings and Bonusz, as well as regular shows in clubs as Berghain and Tresor in Berlin, Lehmann in Stuttgart, and Madrid’s Fabrik.He hasn’t given up cooperating with likeminded artists though! In 2007 he met Ricardo Rodrigues aka Industrialyzer, in whom he recognised an attitude similar to his own. They are both from Portugal, both self-made, and the both have a clear vision of what techno should sound like. As a duo they’re at least as popular as they are as individual artists, playing sold out shows wherever they go, and steadily creating an impressive combined oeuvre. Damon Bradley, is a veteran of the techno, house, and trance music scene. 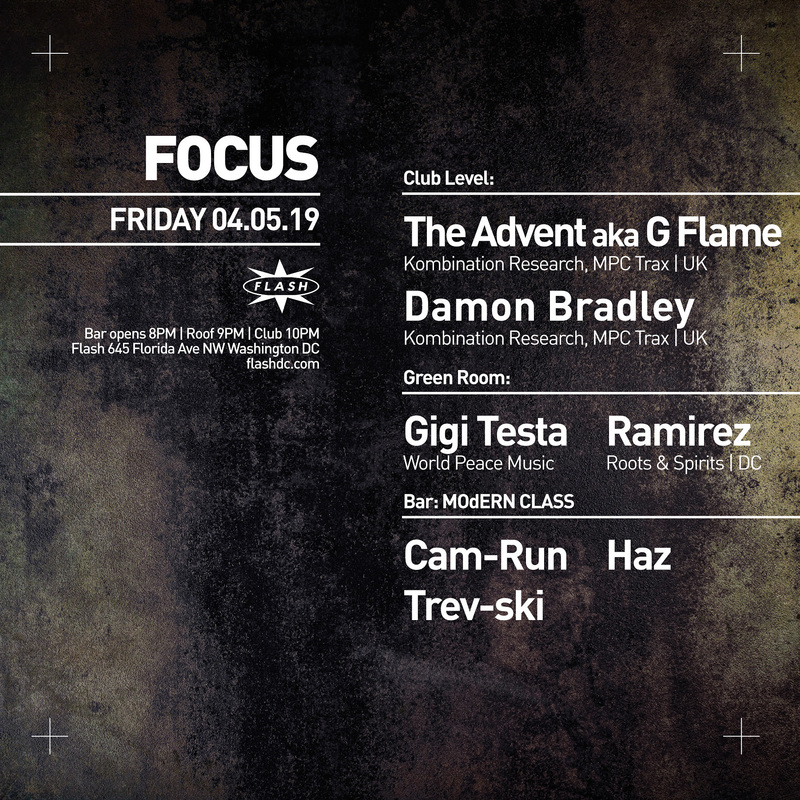 Although a late bloomer to DJ'ing, Damon has been deep into techno, trance, ambient, and various forms of electronic music since 1993, and house since 1989. Originally from Philadelphia, he now reps the DC techno scene and plays at various techno parties there. His influences are the 1990's techno and classic trance scenes. Damon is also the founder of TechnoFist, a Facebook group, podcast, and party series representing DC and NYC techno scenes.